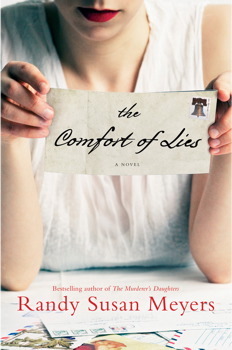 There were a few reasons that I was looking forward to reading THE COMFORT OF LIES by Randy Susan Meyers. First, I read her other novel THE MURDERER'S DAUGHTERS a few years ago and thought it was a very good book. (You can read my review here.) I enjoyed her writing style and thought her characters were extremely interesting. Plus it was a definitely a thought-provoking read -- perfect for book clubs. After reading the description for THE COMFORT OF LIES, I figured the novel would be similar to THE MURDERER'S DAUGHTERS in that the characters sounded complex and there was no doubt that their situations were interesting to say the least. And for the most part, I found both of these things to be true. However, I'm not certain that I enjoyed THE COMFORT OF LIES quite as much as Ms. Meyers' earlier novel. To give you a little background, THE COMFORT OF LIES tells the story for three women and how an event five years in the past significantly affected all of their lives. When Tia was a student, she fell in love with Nathan, a married man with two children. Nathan never had any intentions to leave his family, so when Tia found herself pregnant, she realized it was best if she gave up the child for adoption. Now, she's having regrets. And that's where Caroline enters the picture. Caroline is a successful doctor who wasn't able to have children. To make her husband happy, she decided to adopt a baby which ended up being Tia and Nathan's daughter. Caroline isn't entirely sure that she's mother material since she's having some doubts about the whole motherhood thing. Then there's Juliette, Nathan's wife. She seemingly has it all -- a great husband, two fantastic kids and a very successful business. However, her world falls out from under her when Nathan tells her that he was having an affair with Tia. He promises to never cheat again and they work to repair their marriage, but when she finds a letter addressed to Nathan with a photograph of his daughter, she begins to doubt everything about the man she married. Needless to say, THE COMFORT OF LIES is not a light and happy read. These women have big-time problems, and since the story was told in alternating chapters about each women, the reader really gets to know just how troubled they are. At times, I would even say that they were desperate in their misery and it was almost painful to read about them. Having said that, I appreciated how Ms. Meyers was able to effectively capture each of their individual stories and make the characters stand apart from each other. In addition, she gave the reader some insight into Nathan's character as well, but I didn't find that these chapters were quite as robust as the ones about the women. There is no doubt that THE COMFORT OF LIES is a well-written story; however, I think what kept me from really loving this novel was that I didn't like any of the characters. Of course, I realize it's not absolutely necessary for me to love the characters to enjoy a book, but I did want to feel more for them. And what's odd is that there were parts of these characters' lives (not really Tia's) that did resonate with me. I actually could understand some of Caroline's feelings about being a mother as well as Juliette's doubts about her husband. But for some reason, I wasn't as caught up in their lives as I had hoped or expected. One thing is for certain, THE COMFORT OF LIES would make a wonderful book club pick. There is a reading guide available with fifteen discussion questions along with some ideas to enhance your book club experience. Some of the themes you might want to explore include lies, trust, dishonesty, betrayal, adultery, forgiveness, guilt, stress, and adoption. In addition, I think because I did have a few issues with the characters that there is a lot of opportunity for discussion. I imagine some readers will resonate with these women and passionately defend their actions. Could be fun! Overall, I enjoyed THE COMFORT OF LIES but it didn't exactly "wow" me! I have a feeling that I'm in the minority with this opinion, and if you enjoy women's fiction, then you might want to check it out! I guess on the bright side, you would feel better about your own problems! Ha! I thought I needed to like my characters until I read Gone Girl, but then I realized I just need to find them compelling. I'm not totally sure I would want to read this one. This is the second review I've read. I love character-driven novels but I'm not sure about one with characters that are unlikable. I think I'd like this! Sometimes I love to hate characters! No two readers are alike...I actually enjoyed The Comfort of Lies more than The Murderer's Daughters! Great review, though, as always! It does sound like a terribly sad book--did it at least end on a high note? You don't have to answer that. I imagine I'd feel much the same way as you about Tia. And when it comes to liking characters, yes, it isn't necessary to enjoy a book, but you have to feel some sort of connection to them--at least I do, or else I lose interest fast. Almost all the reviews I read about this book said the same thing about not liking the characters. Not sure I'd like this one. This book intrigues me and I don't always like characters. I do want to read this one.